Tamara Volskaya is considered to be one of the leading contemporary performers on the domra. She is a Merited Artist of Russia, a Laureate of the USSR competition, and a Professor at the Mussorgsky Ural State Conservatory of Yekaterinburg, Russia. Volskaya’s flawless technical ability and expressive performances have stunned audiences around the world from Japan to Europe and America. Tamara is a versatile performer mastering programs on mandolin, as well as on domra. She is a recognized authority in the mandolin world, and a regular guest artist and instructor of the Classical Mandolin Society of America conventions. She regularly appears as a domra and mandolin soloist with orchestras across the US, the former USSR and Canada. Tamara’s recent achievements include a performance at Avery Fisher Hall at the “Mostly Mozart Festival” with Russian baritone Dmitri Hvorostovsky, and at Merkin Hall as a soloist with chamber orchestra “Bachanalia” under Nina Beilina. In January 2004 she was a soloist in the concerts with the Seattle Chamber Orchestra performing two concertos for the mandolin by Vivaldi and by Pergolesi. In March 2004 Tamara completed a concert tour to Russia where she performed a world premiere of the new concerto for domra or mandolin by a famous modern Russian composer Yefrem Podgayts. In 2006 she had successful concert tours in Japan, Spain, Russia and Canada. In November, 2006, Tamara was a soloist with Shevchenko Mandolin Orchestra (Canada) and performed at famous Glenn Gould Studio in Toronto. 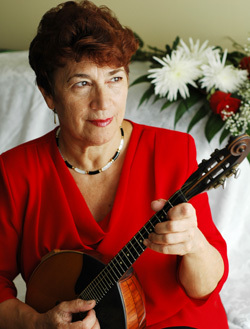 In 2007 - 2008 Volskaya toured to Spain and Israel, twice to Russia, and twice to Japan where she performed as a solosit with mandolin orchestra and in duo with Anatoliy Trofimov. Tamara is not only a gifted performer, she is also a recognized teacher. She organized and headed the Folk Instrument Faculty at the Conservatory’s School for Gifted Students in Russia. Many of her students are winners of international and national competitions. She has conducted numerous master classes on the domra and mandolin worldwide, and is the author of several scholarly works on the domra. In America, Tamara has done a great deal to popularize Russian Folk instruments in the cultural world of New York City. Together with her husband, Anatoliy Trofimov, she has organized “Russian Carnival”, a Folk Russian Instruments ensemble, which attracts audiences by emotional and festive performances. Soon after the “Russian Carnival” ensemble was established, the group became a prominent feature of New York City’s musical scene. The ensemble’s highlight of 2004 was its performance at Avery Fisher Hall as part of the “Russian Splendor” program. In February 2006 the ensemble had a recital at the famous Weill Recital Hall of Carnegie Concert Hall. Tamara’s repertoire, both on domra and mandolin, spans a wide range of musical periods and styles, from classical to modern, as well as folk music based on Russian, Flamenco, Gypsy, Jewish, and American themes. It includes the great violin classics such as “Introduction and Rondo Capriccioso” (Saint-Saens), “Zigeunerweisen” (Sarasate) and others. Tamara also masters a repertoire including Vivaldi’s Concertos, “Russian Dance” from Swan Lake (Tchaikovsky), “Rhapsody in Blue” (Gershwin) and selections by Scarlatti, Beethoven, Chopin, Kreisler, Shostakovich, and many more. Volskaya's unusual musical talent, combined with great emotional depth, exceptional musicality, impeccable taste, and virtuoso command of the instrument, has made her one of the greatest masters ever on the domra.